The Great Commission is not just for professional clergy; it is a charge to every follower of Christ-ordinary Christians like you and me.Bob Roberts Jr. urges disciples of Jesus to reclaim their role in God's transforming work around the globe. 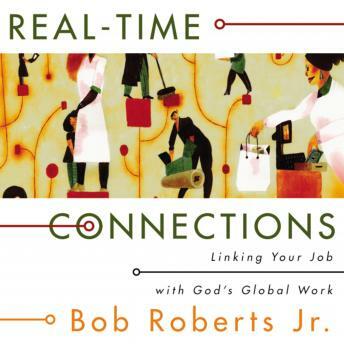 In Real-Time Connections, Roberts illuminates the ways that Christians from all walks of life can use the everyday associations of their work for the service of God's kingdom.It's an ancient idea in a new global reality. The growth and influence of the first Christian communities came from people of every vocation. Today's global economy offers followers of Jesus opportunities to interact with nations and people groups once accessed only by remote missionaries.Real-Time Connections helps readers shed preconceived notions of what it means to "go into all the world" for Jesus, equipping them with practical guidance and encouraging them with firsthand stories of real people doing just that. Readers can discover their vital role in expanding God's kingdom around the globe using skills and talents that they already have.